Having only books and radio for entertainment at the farm is one of my favorite reasons for wanting to make it my full time lifestyle. I have nothing against learning from the internet but I find I absorb information much better through focused and singular vectors like books and magazines. While reading How to Grow More Vegetables, Eighth Edition: (and Fruits, Nuts, Berries, Grains, and Other Crops) Than You Ever Thought Possible on Less Land Than You Can Imagine by John Jeavons, I came across a claim by Alan Chadwick who is one of the pioneers of modern organic gardening. The claim is one I have seen many times and is usually qualified by phrases like “by observation”. Apparently, Greeks noticed that plants grew best on soils from recent landslides. The idea that these during the landslide, the soils were highly aerated which provided easy root penetration that facilitated nutrient absorption. While I not found any scholarly source to back this claim, it is logical and inline with plant ecology knowledge regarding plant succession following a major soil disturbance. Having made these observations, the Greeks invented the raised garden bed in an effort to emulate landslide conditions. I do want to note that the book also mentions contributions by other civilizations to organic gardening practices and was both informative and enjoyable to read. Here is my longest bed being prepared. Beds are built into the slight incline with collected scrap and discarded, low quality wood from around the farm. Old fence boards were the main source of lumber while smaller pieces were split and made into stakes to hold the raised beds up. Its not pretty, but it is functional and free! In order to smother grasses and weeds, I put down cardboard from which I had removed any tape, glue or staples. Normally I wet the cardboard first, but this preparation was hurried to beat the incoming winter storm which would saturate the cardboard anyway. I overlapped any joints or slits in the cardboard to ensure complete coverage. The idea is this one-time application will kill any perennial turf or broad leaf species then break down into organic matter once the soil microbes come out of dormancy. On top of the cardboard, I piled well aged horse manure/bedding mix to a depth of about 2 inches. Once the soil is workable, I will perform a onetime deep tilling to incorporate all of the organic matter into the subsoil. 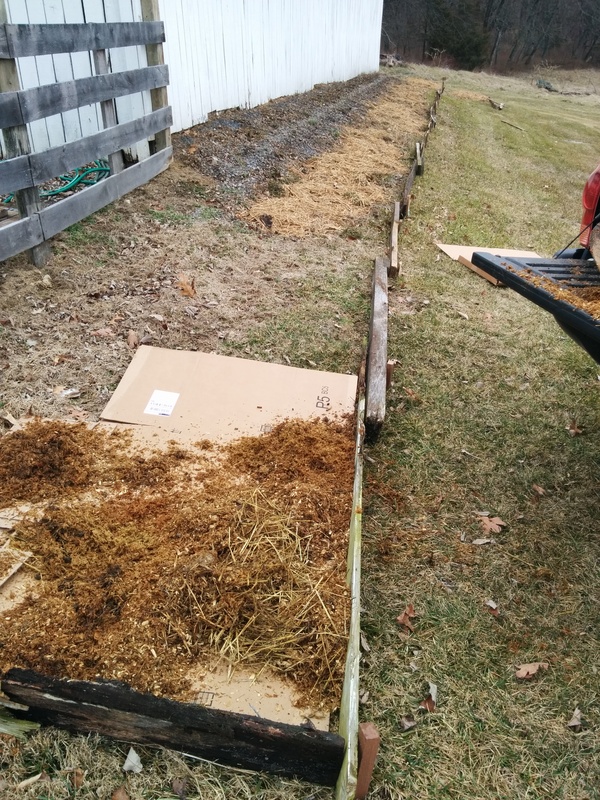 Since this bed is for perennial plants, a surface incorporation of fresh compost will be performed as needed. Note: I started the far end of the bed with a load of manure when I was home from the middle east for the Thanksgiving holiday. It is almost a solid black and still hosted many worms despite the winter temperatures fluctuating between single digits and 40 degrees Fahrenheit over the past month! On top of the manure, I mulched deeply with hay that was inside and underneath the manger inside of the barn. Livestock has not been on the property in about 15 years so the hay is old and useless as feed, but perfect for mulching! There are also 15 huge round bails of 15 year old hay in the loft of the barn that I have no idea how to use. Since carbon is so precious on a farm, I think I’ll slowly use it as garden mulch, animal bedding (mixed with more absorbent material like sawdust) or in compost piles. Any other suggestions? And interesting to learn about the Greeks’ contribution to farming. There were other stories about the gardening practices of the Mayans, Mesopotamians and Ancient Chinese in the book I linked. It was a fun read for being such a good resource! Maybe I will find this book to read for myself!